As part of Boycott Workfare's week of action, Haringey Solidarity Group will be picketing outside Harringay Homebase tomorrow, Sunday from 1pm-2pm in protest at use of unpaid workers at their Willesden store. Join us on Sunday 14 July, 1pm at Homebase Harringay, 430 Green Lanes, N4 1DT. by Harringay Green Lanes rail station. Earlier this year, we picketed their store in response to their use of the Job Centre's work experience scheme which forces claimants to work for their dole, or face cuts to their benefits. Homebase later made a statement confirming they would not use any further recruits from the scheme, but it seems they have now gone back on their word and have been up to the same tricks at their Willesden branch. Pickets, protests, and online pressure are meeting each organisation that is found participating in the government's latest and longest workfare scheme - Community Work(fare) Placements. On Saturday morning, 16 August, Haringey Solidarity Group held a picket outside North London Hospice charity shop on Wood Green High Road (near Turnpike Lane) about their involvement with the six-month long, forced labour scheme. The picket attracted lots of interest and support from passersby, with some saying they would no longer shop there and others saying that they would contact the hospice to let them know about their concerns. We have spoken to at least two people on Community Work Placements at this shop, and others at the shop near Wood Green tube. You can find more details about how to get in touch with North London Hospice in our article here. Community Work Placements in Haringey - who's proud to be working with G4S? While the government would like to keep their names secret, the companies involved with running the recently launched Community Work Placements seem proud to publicise their involvement. But, being as they are the world's largest security company, G4S isn't bothering itself with the day-to-day business of sorting out placements for workfare conscripts. Instead, they have teamed up with "top-performing placement brokers" in the six regions for which it has a CWP contract. One of these regions is West London. This is the one that covers Haringey and, of the five partners it has here, only one, Urban Futures, appears to have an office in Haringey. They have expressed similar delight at their involvement with the government's newest forced labour scheme. We have tried to figure out exactly what Urban Futures do, but their website, with all its talk of employment, training and apprenticeships, manages to hide the fact that they are fully signed up to a programme that threatens some of the most vulnerable people in our community with destitution and abject poverty. Urban Futures may or may not be a lost cause, but we want to find out the names of the local charities and community organisations that they are using to fulfil their part of the CWP contract. We have been talking to the people going in and out of Urban Futures' Wood Green offices. So far, the only confirmed partner is North London Hospice. According to personal testimonies, they have taken on a number of workfare conscripts in their Wood Green shop, and possibly others. Many of us in HSG were really disappointed to hear about this. North London Hospice provides a service which places value on the quality of life of local people. Its complicity in this workfare scheme seems totally at odds with its main aims. On Saturday, 7th. February, North London Hospice held a major fund-raising event, "Strictly Dancing", at the Arts Depot in Finchley. This event promised to draw not only senior staff from the charity but also supporters and well-wishers. As part of our ongoing campaign to persuade NLH to withdraw from the Community Work Placement programme, we decided to attend the event with the express intention of alerting attendees to the use of CWP by the Hospice, whilst providing substantive arguments as to why a charity working for the good of the community should not. DIY chain Homebase has withdrawn from a controversial government scheme for jobseekers after a series of protests outside their store in Harringay Green Lanes. store on Green Lanes had over 20 workfare placements and benefitted from 750 hours of unpaid labour every week. No pay at the YMCA? Today members of Haringey Solidarity Group joined Boycott Workfare in paying a visit to the London headquarters of workfare exploiter YMCA. They’ve defended their use of unpaid, forced work in previous statements and we’ve called them out on it. Mandatory Work Activity forces people to work without wages under threat of sanction, and doesn’t help them find a job anyway. Whereas the Salvation Army have stated they will not get involved in the new 6 month long Community Work Placements starting later this month, the YMCA have yet to make a public statement on the issue. The YMCA wants to have its cake and eat it. Their president, Bishop John Sentamu, has spoken against workfare. Yet, the organisation still takes part in some of the harshest schemes. They’re also involved in delivering traineeships – workfare by another name. We say volunteering should remain just that, and that people shouldn’t be “made to volunteer” under threat of sanction. The fight against workfare is more important than ever, with 74,000 people being sanctioned every month. Sanctions are one of the main reasons people are turning to food banks to feed themselves, and you can now be sanctioned for up to three years. This is forcing people to make the choice between heating their homes or eating. About fifteen people, turned up at the North London Hospice Shop in Wood Green today, to protest at their use of forced labour, and to ask them to sign up to the Keep Volunteering Voluntary pledge. North London Hospice has been staffing some of its 18 shops across Barnet, Enfield and Haringey with people on Community Work Placements. These people are forced to work for their benefits, or they face having their benefits stopped - four weeks for the first breach, and 13 weeks for the second. We had some lengthy chats with people working inside the shop - mainly those lucky enough to be paid - and were surprised and saddened to hear the view that the people on CWP had a "choice", that they were not forced to work there. This "choice" is not a choice at all - it's the choice between working at the shop, or facing having your benefits stopped, leading to possible destitution or starvation. Hardly a choice at all. Article 4 of the Human Rights Act protects the right of humans to live free from forced labour - this is work which is carried out under threat of physical or psychological harm. In many people's eyes, six-month workfare comes pretty close to contravening this right. This is one of the many reasons why we are asking charities like North London Hospice to reconsider their involvement in the scheme. It's why we want them to pledge not to staff their shops with anyone other than those who are paid a (living) wage to be there or who have genuinely offered to volunteer their free time. Have a look at our earlier articles for more info on how to contact North London Hospice, if you have any views on their involvement with workfare. On the afternoon of Friday 7 March members of HSG headed to Poundland on Wood Green High Road to hold a protest against the company's continued use of free labour, in particular its exploitation of young unemployed people, as part of the government's workfare schemes. This Saturday, 6 December, 12.30pm. Join us on a picket of North London Hospices shop on Wood Green High Road (Turnpike Lane end). Haringey Solidarity Group continues its support for claimants referred to Urban Futures as part of the hated Community Work Placement scheme. On a weekly basis, claimants tell us the shameful way in which they are treated by Urban Futures, the local organiser of the CWP scheme and the way in which they are then forced to spend 30 hours per week hanging around in a charity shop rather than using their time constructively creatively or in any other way they choose. Claimants and HSG have been campaigning against NLH's participation in the scheme for almost 3 months precisely because NLH is Urban Futures' largest partner, providing some 50 placements. We believe that if we can persuade NLH to pull out of the scheme, life will become pretty difficult for Urban Futures and the CWP scheme in the local area as around 20% of Urban Futures' placements are with NLH. They would find it very difficult to replace them quickly hitting them financially, providing some relief for claimants and raising serious questions over the whole project. 'MAKING WORK PAY' is a hypocritical euphemism used by Iain Duncan Smith and the government to justify cuts in welfare benefit payments and make claiming increasingly difficult. With this completely false statement comes no assurance or intent to increase and legally enforce a minimum wage significantly, in line with the massively inflated costs of rent, food, utilities and travel. Community Work Placements actually undermine job security and the minimum wage. They do not create jobs, they create an excuse for less scrupulous employers to take on free labour and get paid by the Government (tax payer) for doing so. Along with this the increase of zero-hours jobs means the job market has become extremely precarious for many. You can see other films on similar issues on YouTube. - Sat 7 Feb, 6.15pm - join our protest at North London Hospice's Dancing Strictlyfundraising event in North Finchley to ask "Waltz going on with workfare?" Since August last year, Haringey Solidarity Group has been campaigning for North London Hospice to stop taking on people on 30-hour a week workfare schemes in their shops. (For more info, see our full web article 'Why North London Hospice should keep its word and pull out of workfare'). The hated and hateful six-month Community Work Placements (CWP) are backed by the threat of sanctions, i.e. having your benefits cut off for four weeks or more. Many of us in HSG have reason to respect the great work that the hospice does within our local community. So we tried contacting the hospice, to let them know that CWP is not voluntary, and we tried leafleting passers-by outside their shops. Finally, in December, North London Hospice's Chair of Trustees wrote to us, stating their intention to stop using workfare once current placements came to an end. He refrained from giving a date for their withdrawal from the scheme, leading some of us to fear that their "intention" could mean another six months' misery for claimants on CWP. Then, just a couple of weeks ago, we found out that, contrary to the letter, North London Hospice had taken on a new placement and possibly more. Furthermore, it has been over a month and a half since their letter to us, and not one of the shop managers we have spoken to is aware of this proposed withdrawal from the scheme, and the chair of trustees has to refused to give any indication of a date for withdrawal. So our campaign against workfare at North London Hospice continues. This Monday, 2 February, we are asking people to join our North London Hospice "communications conga" and contact the hospice, via social media, phone and email, asking them to pull out with immediate effect. Then, the following Saturday, 7 February, 6.15pm, we are asking for support at North London Hospice's "Dancing Strictly" fundraiser, when we hope to speak directly to their supporters, and for them to ask the hospice management, "Waltz going on with Workfare?". Phone: 020 8446 2288 (Fundraising team) or you can find the numbers for their 18 shops online. (NB: We are asking people not to contact the main hospice switchboard number.) Please also remember, if you call them, it’s definitely worth trying to speak to a manager, or someone involved in fundraising and volunteer organising. The person who answers the phone may well be low paid admin staff, or possibly on workfare themselves. Join Haringey Solidarity Group from 6.15pm at the Arts Depot in Finchley. The event starts at 7pm. Bring friends and (dance-themed) placards. ArtsDepot, 5 Nether Street, North Finchley, N12 0GA. Tube: Finchley Central (then bus); Woodside Park and West Finchley (20 mins walk). Buses: 82, 125, 134,221 (from Turnpike Lane), 263, 460. Or see the Artsdepot websitefor directions. See our website for more background information on the campaign. We all know Community Work Placements aren’t about helping people find work. Instead, forced unpaid work and supervised job search treat the unemployed like criminals. Six months of workfare is more than twice the maximum community service sentence! CWP forces claimants to work for 34 hours a week – most of the time doing pointless and menial tasks. And all for £72 a week – that’s about £2 an hour. CWP is forced labour. Placements with no relationship to our experience or what we want, bullying and mistreatment, and pointless and menial placements - all under threat of benefit sanctions - are totally wrong. But together we can fight them. Know your rights, name and shame placement hosts and get involved to help end all workfare! Urban Futures: breaking the rules? Urban Futures is making money out of making people’s lives a misery. CWP shouldn’t exist in the first place, but are Urban Futures even following the rules? Placements must be of clear and demonstrable benefit to the community. Placements must give work experience and develop skills. Support for claimants should include appropriate help and workplace training. Work placements must be supervised with tasks similar to those in a normal working environment. No more than 25% of the placements they arrange should be in charity shops. Provider must establish claimants’ current job goals. Placements must not displace existing jobs. Claimants must start placement within 20 working days of Jobcentre Plus (JCP) referral. 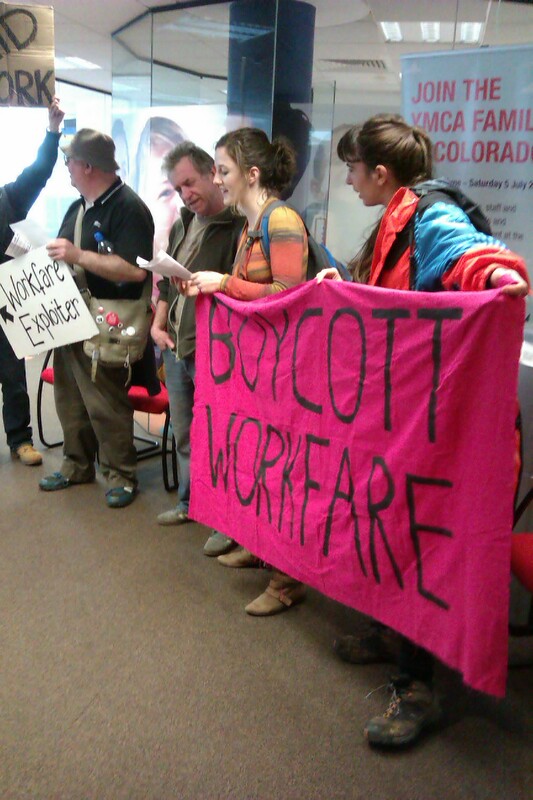 Urban Futures occupied: Six month workfare no way! Today members of Haringey Solidarity Group and Boycott Workfare paid workfare provider Urban Futures in Wood Green a visit. Fifteen people occupied the office with banners and a soundsystem – challenging Urban Futures on their treatment of claimants and speaking to people on enforced jobsearch about their experiences and sharing info on their rights. We'd already heard that the managers are aggressive and bullying towards claimants, so expected the same. But the short occupation revealed the nasty attitudes throughout the staff team – about ten staff tried to hassle people out and came out with some revealing lines, taunting a number of us that we should "get a job" (yawn). When one of us replied that he had a job, they replied, "I can't believe you have a job, looking like that." Staff tried to make sure claimants didn't access info on their rights. They confiscated leaflets and tore them up, and blocked doors to claimants inside the job search rooms. They grabbed phones and bags off people and tried to take the banner too. Video: Urban Futures occupied - six-month workfare no way! Reel News footage of our Urban Futures occupation as part of the Boycott Workfare week of action against workfare. Come to an info and skill-sharing day in London on 15 February, 10.45am-5.30pm, Maiden Lane Community Centre near Kings Cross. Directions here. Getting your welfare rights is about a lot more than just knowing your welfare rights. Across the UK, people are getting together to support each other and pushing back workfare, standing up to sanctions, wrong decisions, and insecure housing. Meet others from across the UK, hear inspiring stories, learn info about our rights and share tactics that work. This isn’t a day for speakers from the front. Party political representatives aren’t invited. It’s about people at the grassroots getting together and working out how we can support each other and throw even more spanners in the government’s plans! If you are in a local group where people share mutual support on welfare or housing (or plan to start one), Boycott Workfare should be able to help with your travel costs. Please get in touch as soon as you can so we can sort it out. Planning on coming? There’ll be tea, coffee and a free lunch! Please let us know you’re coming so we know how many people to cook for! Want to know what to expect? Check out the agenda here. There’s an open space session in the afternoon if you’d like to offer a workshop too! Faced with policies that are pushing ever more people into precarity and poverty, thousands of us have been coming together to support each other. We are pushing back workfare, standing up to sanctions, challenging the work capability assessment and fighting insecure, unaffordable housing. 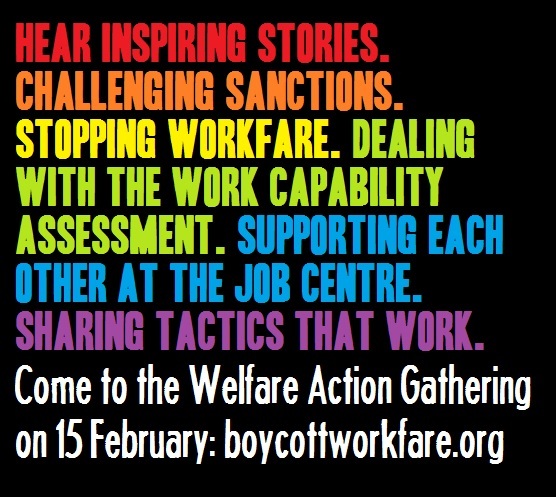 …then do something about it and come to the Welfare Action Gathering to hear from other people organising across the UK! Learn about our rights and share ideas and tactics! Join the Facebook event and invite others to come too! This isn’t a day for speakers from the front. Party political representatives aren’t invited. It’s a day for people at the grassroots to get together and work out how we can support each other, defend our rights and continue successfully to campaign against workfare and sanctions. Organised by Boycott Workfare with Haringey Solidarity Group. Workshops and contributions from other groups are very welcome! Why is North London Hospice still using workfare? On Saturday, 11 October, from 12pm, we'll be outside North London Hospice's Wood Green shop, as part of Boycott Workfare's week of action against workfare. And once more, we'll be asking them, why they are still involved with Community Work Placements and other workfare schemes. Join us from 12pm at North London Hospice shop, 19 High Road, N22 6BH. Three minutes’ walk from Turnpike Lane tube station. Hundreds of people in Haringey are being forced to work for six months with no pay under threat of sanctions under the new scheme. Urban Futures have a contract for Community Work Placements and are busy finding placements in charities and “community benefit” projects across north London. But these schemes cannot work without charities making the placements possible – charities like North London Hospice.